The prospect of a typical Heist movie is rarely, if ever, met with the voracious expectation of originality by legions of salivating fans. Rather, a heist movie such as TOWER HEIST is expected to provide an assortment of thrills that generally follow a loose but ultimately formulaic template. The genre has generally been defined by a repetitious history, regardless of whether the template chosen is of a serious or more comedic nature. Audiences of recent years will largely be familiar with the trilogy of OCEAN’S films, with the first in the trio setting the standard for the comedic heist thriller of the last decade. Once the elaborate crime is in motion TOWER HEIST does little to dispel the suspicion that it will not be the film to break the mould, yet it is in the nature of its protagonist’s that TOWER HEIST stands out. Unlike OCEAN’S ELEVEN, TOWER HEIST follows the fumbling attempts to secure a multi-million dollar figure from a fraudulent Wall Street businessman. 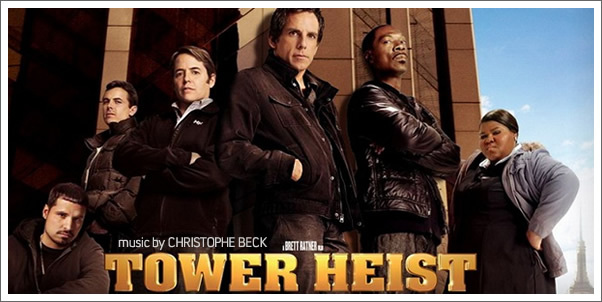 The idea that, apart from one character TOWER HEIST’S “heroes” are all amateurs is clearly the catalyst for comedic capers perhaps unseen in previous heist movies. Not only does this provide the filmmaker’s with an opportunity, it also provides composer CHRISTOPHE BECK with the chance to walk a road less traveled. From the opening titles of TOWER HEIST, it’s obvious that despite this, TOWER HEIST is going to offer little more than the stereotypical swagger of a heist score with an added dash of comedic tension thrown into the mix.